The Power Rangers Time Force Story: When villains wreak havoc in both the past and future, only one thing can stop them: the Power Rangers Time Force. This team of super teens is the galaxy's best defense. The legendary squad faces new and extreme danger as each adventure sends it to a different time in history. Equipped with futuristic vehicles and weaponry, the Time Force Power Rangers leap forward and backward through the ages to defend wherever--and whenever. Power Rangers Time Force Deluxe Time Jet Vehicle - In the year 3000, the fugitive Ransik evades capture from the Time Force Quantum Power Rangers, but, hopefully, not for long. 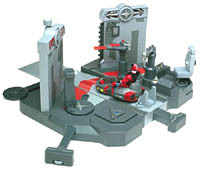 With this well-equipped control center at their disposal, the Power Rangers have access to an arsenal of weapons designed to keep this evil force at bay. Outfitted with a slick, silver, one-man vehicle, a missile launcher, and a handheld blaster, Red Ranger has all he needs to fight well and long. The red-and-gray plastic control center itself is full of terrific features. Two light-activated shields open and close to let vehicles and Rangers through, while four separate control areas provide strategic positions for Rangers to wage battle. When in position, the Rangers can fire weapons, move back and forth, and activate six different realistic battle sounds and flashing lights. Easy to put together, the set comes with a Red Ranger and a wonderfully detailed model of his arch foe, Ransik. > Power Rangers Time Force Deluxe Time Jet Vehicle - This Deluxe Time Jet allows defenders of the universe to fly to danger and then promptly defeat it with its flight and weapon modes. Once vehicle assembly is complete (easily done by snapping on two parts), the jet can fly to its destination in time, aided by a 5-inch- tall red Power Ranger action figure, which is included. The press of a button sets off cool light and sound effects that make the trip through time go much faster. When the large, plastic plane has arrived safe and sound, remove the pilot, turn it over for weapon mode, and pull the trigger to fire the two yellow foam darts simultaneously. Transforming between modes is simple, the jet isn't too cumbersome for small hands, and the darts get quite a bit of distance. Once again, the Power Rangers supply the cream of the crop in gadgetry for young heroes. Power Rangers Time Force Deluxe T-F Eagle Vehicle - The Power Rangers have never had a shortage of cool gadgets and vehicles to help them save the universe. This Deluxe T-F Eagle jet is not about to ruin that fact, either. The large, white flier has black- and-gold detailing and switches between attack mode and flight mode in four simple moves. A hidden switch at the rear of the plane can be turned on to create light and sound effects. The wheels on the bottom of the jet provide easy rolling for takeoffs, but they cannot be tucked away during "flights." A 5-inch-tall Quantum Ranger is included and fits nicely into the Eagle's cockpit.